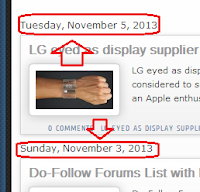 As you have probably noticed, Blogger displays the current date only once in your posts on top of them (on the main page). It means to say if you published more posts on the same day only the above post will have date and time of the post on the same day. Blogger groups articles written on same day together, and the template variable data:post.dateHeader is only set for the first displayed post of the day which is the last post of the day because of non-chronological blog post order. I saw some instructions to replace date Header by timestamp, that is ok but you lose the timestamp under the post. The importance of date is for the sake of the readers. You will notice that the chronology of your articles on your site has something to do with what readers may read or may resort to. For readers who are into current events, as much as possible they would resort to your latest and that is something that you need to work out by tweaking the current date on every post. Here is how to display the current date on top of each Blogger blogs post, even if the posts are published on the same date. Just Follow the instructions below. Step 2. Make sure you check "Expand Widget Templates". Step 4. Then, you can tweak the date to your linking, by going to your Blogger Dashboard > Settings > Formatting and look for Timestamp Format and select the date format you desire. Your welcome, thanks for the comment. 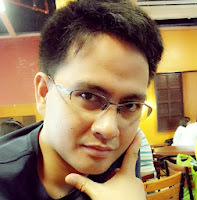 you're free to browse all other useful blogging tips on this blog, see you around. Thank you for this, it worked perfectly! Your welcome, Thanks for leaving your feedback. Happy Blogging! I look for this trick.